HOUSTON- Omar Strong scored a game high 27 points as Texas Southern defeated Alabama State 97-65 in a rout on Monday night. A total of five TSU scorers reached double figures for the Tigers (8-14, 7-2 SWAC), as TSU has now won three in a row and seven of their last eight games. Lawrence Johnson-Danner had 20 points and six assists, Ray Penn tallied 19 points and eight assists and Fred Sturdivant had a double-double with 13 points, 14 rebounds and three blocked shots. Aaron Clayborn had 11 points and nine rebounds for Texas Southern, which built its largest lead of the game at 38 points in the second half. The Tigers were 16 of 28 from 3-point range, with Johnson-Danner making six and Strong and Penn converting five attempts. The 16 successful three point baskets marks the most three pointers TSU has made in a game all season. 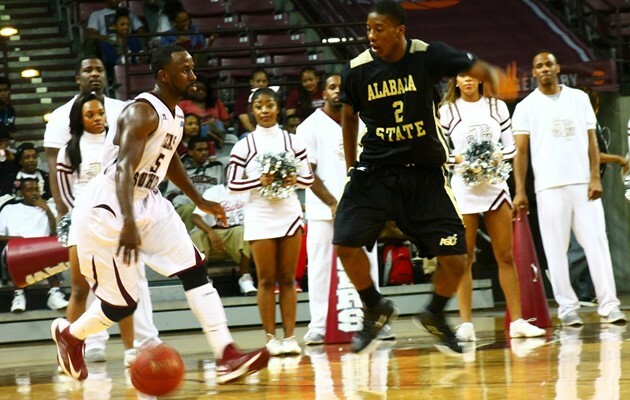 Alabama State’s (6-16, 4-5) only advantage of the contest came within the first three minutes of the game as Texas Southern applied constant defensive pressure. Texas Southern next game is schedule for Saturday as the Tigers get set to host Prairie View A&M. Tip-off time has been slated for 8:00 pm.